All transactions are safe and secure with a reliable history in online purchasing behind each of our associates. Buy the Lou's Iron Maiden Killers t-shirt to own Hot Tub Time Machine clothing and merchandise. 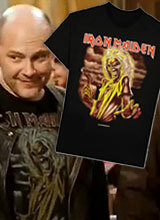 If you have seen the movie Hot Tub Time Machine, then you recognize this black Iron Maiden Killers t-shirt as the tee that Lou wore during the eighties. It features the cover art from Iron Maiden's second album, Killers, that was released in 1981. Not only does this metal head wish that he could be a real life rocker, he makes it happen by changing his future in the past. Motley Lue anyone? If you are a fan of Iron Maiden, the eighties in general or just admire Lou's hard partying lifestyle, then this Hot Tub Time Machine t-shirt is sure to please. Grab a Chernobly energy drink and rock on! It's like liquid Twittagra. In addition to the Lou's Iron Maiden Killers tee above, browse the Hot Tub Time Machine Clothing Gallery for more apparel like men's and women's clothes, kids shirts or hoodies.